The assumptions in life-and-death (tsumego) problems are rarely spelled out. there are worthwhile non-local ko threats. When asked for the best result in an isolated life-and-death situation, this order usually applies, assuming you are the defender. Reverse the lists, if you are the attacker. Also note, that life by double ko counts as "unconditional life". Also note, that the number of internal threats can be important, since it can in effect change the player who gets to take first. Other kinds of ko (multi-stage ko, eternal life, etc.) do not fall in this list very nicely, so you have to judge their goodness in the context of the given problem. Generally however, a thousand year ko is better for the defender than a direct ko. In an isolated problem it does not really matter what kind of ko threats are left behind, so all sequences that kill unconditionally are usually considered equal. The only notable exception is death by double ko, which gives an infinite number of ko threats, and thus has to be considered better than "just dead". There is usually no call to read ladders, but logically speaking we should assume all ladders are good. Note that being chased in a ladder doesn't count as escape. To be quite precise is a little tricky. Something like this: we assume an otherwise empty board that is semi-infinite in any direction with an unmarked corner, but is a large band (to make ladders work); and we add in a second board as direct summand for ko threats to inhabit. On the J-groups page you can find some more talk about conventions: for example the explicit placement of stones as barriers to escape. Note that "escape from the local position is good enough for life" also applies to stones surrounding the target groups. 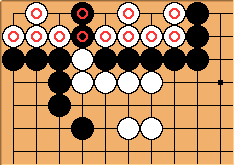 For example, in this diagram, we say that the marked stones are in seki. Of course, that is conditional on the outside stones being alive, so that makes the status of the target groups slightly uncertain. However, since all the outside groups can escape and it is not realistic to assume that any of these groups can be captured at this point of time, by convention, we take the marked stones to be in seki. Unconvinced readers can argue till the cows come home about what happens if Black starts attacking the exterior White group, or vice versa, but such arguments are not productive when all the diagram creator wants to do is to construct an example to convey some concept. Such a convention spares the person making the diagram from having to give two eyes to every exterior group, and actually makes positions more realistic, like those appearing in actual games. Of course, the convention mentioned above does not apply if it can be shown that some surrounding key stones can be captured. 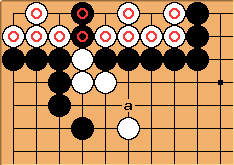 In this diagram, Black can capture the three key White stones at a, so we cannot claim that the marked stones are in seki if Black plays first.